Melaniq is a food supplement, manufactured by the British nutraceutical and cosmeceutical company Oxford BioLabs – the makers of TRX2. 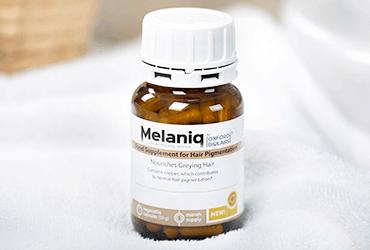 Melaniq is designed to support hair pigmentation by boosting melanin biosynthesis in the hair follicle and thus reduce the process of greying. Melaniq is made in a cGMP-compliant facility in Germany. The food supplement contains natural ingredients that have been approved by the FDA for human consumption. Grey hairs arise when melanin is not produced in adequate quantities by melanocytes within the hair follicle. Greying can start at any age and is determined by numerous factors including diet, lifestyle, pollution, and genetics. The exact reasons that trigger the onset of greying vary from person to person. However, what is known for sure is that hair follicles that do not get enough nutrients and minerals or are bombarded with oxidative stress, slowly lose their ability to produce melanin. As a result, they are unable to produce pigmented hair. Melaniq contains natural ingredients that have been proven through clinical studies to improve, maintain and protect melanin biosynthesis. This way, the food supplement lessens the impact of several factors that contribute to greying, thus slowing down the process. In order for melanocytes within the hair follicles to produce melanin, the hair pigment, they require the aid of the enzyme tyrosinase. This enzyme contains copper at its active site and also utilizes L-tyrosine to activate the process of melanin biosynthesis. Melaniq provides both copper and L-tyrosine in order to boost start melanin production. Another core ingredient of Melaniq is biotin, which helps maintain hair strong and healthy. In addition to these core ingredients, Melaniq also contains a plethora of antioxidant vitamins and green tea extract that fight off the oxidative stress that can impair the production of melanin. The daily recommended dose is 3 capsules; one pill to be taken in the morning, one at noon and one at night time before going to bed. It is recommended to take the supplement with food. Melaniq is designed to help those that wish to keep grey hairs at bay for as long as possible. Taking the supplement regularly will help individuals maintain their natural hair color longer. The effects of the treatment can vary from one individual to another, yet results can be seen approximately 5 months after adding the supplement to the diet. Hair grows healthy and pigmented, grey hairs nowhere to be seen. Melaniq does not claim to be able to reverse the process of greying. For those at an advanced stage of greying, the effects of the food supplement will be subdued. The product has not been shown to cause any side effects. However, if you fear that ingredients might interact with your current medication or existing physical conditions, consult your physician before taking the supplement. The product does not contain any major food allergens. It is suitable for vegetarians. Melaniq is not intended for children, pregnant or nursing women. You can order the product online, directly on the company’s sitedirectly on the company’s site. They ship free to the EU and USA. The company does offer 60 day money-back back guarantee for this product.